In reality the strike to save the mining industry and jobs was a challenge to government, a political strike that could not have been won by the miners alone. 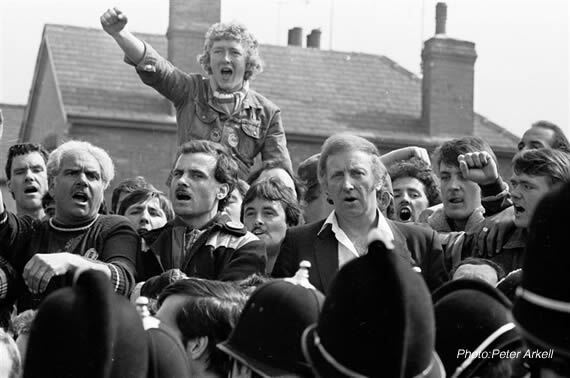 Peter Arkell reviews a new book about the 1984-5 miners’ strike. The year-long miners’ strike of 1984-5 generates huge passion and controversy, even after 25 years. The bitterness and anger felt by the strikers against those who worked on has hardly diminished in most of the former coalfields, and is likely to be carried forward into the next generation, and even the one after that. Many strikers also remain defiant and feel that they should and could have won, but were let down, betrayed not be their own leaders, but by the leaders of the wider labour movement, who sat on their hands and allowed the miners to take on the state and government on their own. So a new book on the strike Marching to the Fault Line by Guardian writers Francis Beckett and David Hencke is not likely to be a best-seller amongst the former strikers because it puts forward the point of view of these very same leaders of the TUC and the Labour Party. And it also attacks the strategy and tactics of Arthur Scargill, the president of the miners’ union, the NUM, who refused to co-operate with the authors. The perspective and ideas that inform the book are those of the Communist Party where it is now the accepted wisdom that Scargill not only misled his troops and misjudged the political situation, but also missed out on several possibilities of doing a compromise deal with the National Coal Board. The party itself remains tied to the reformist outlook of union leaders. Believing in the parliamentary system above all else, it has never had any intention of fighting the capitalist state and remains a Stalinist outfit. Scargill is also criticised for not calling a ballot, for keeping the TUC at arms length until it was too late, for his picketing tactics and for his handling of the press. He should have seen the industrial correspondents of the national papers as possible allies, and used them in much the same way as the National Coal Board and the government used them to get their perspectives across. What is really missing from the account in the book, however, is a real understanding of the context in which the strike took place. 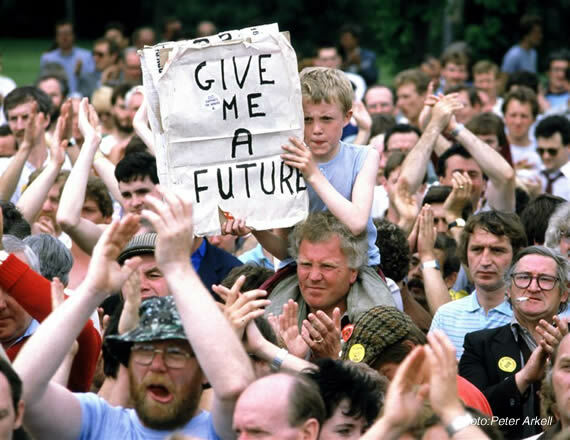 In four short years, two Thatcher governments had brushed aside the old formulas for doing business which traditionally involved consultation with the unions in an attempt to reach some kind of agreement with them in the making of policy. Before 1979, governments were always summoning the TUC leaders to Downing Street in order to bring them, nominally at least, into the business of governing. The Thatcher government dispensed with all this politeness, preferring instead to pursue shock policies of mass unemployment, closure of unprofitable industry regardless of social consequences and the privatisation of the great state industries, without any attempt at an agreement with the unions. By the time of the miners’ strike for jobs the official unemployment figure was 3.25 million while the actual figure was nearer to 4 million. Thatcher’s true (and hidden) agenda was to turn the UK into one of the centres of the new globalised economy, making it fit for the corporations while throwing millions of people into poverty. In this situation, with the working class pushed back, but not defeated, it was the miners’ leaders who answered history’s call and challenged the Thatcher agenda in the reasonable hope and expectation of uniting all workers against the government’s plans. The government knew that, which is why they mobilised all the forces of the state to defeat this threat. The miners’ leaders also understood this perfectly well. But the Labour Party leader Neil Kinnock, the leaders of the TUC and of the big unions, acted as if the strike had little or nothing to do with them. It was an embarrassment. All they wanted was to settle it with a compromise and move on. They, together with the authors of this book and the Communist Party in general, hid behind the demand for a ballot, the calls for peaceful picketing (whatever that meant in the context of this most violent dispute), behind any policy which in fact blurred the true meaning of the strike. The book, of course, does pay lip service to some of the background history and does expose a lot of new facts and details, in particular the thinking and actions of the government, the NCB players and the union leaders. But it nevertheless tells the story of the strike as a thing-in-itself largely divorced from its vital, dynamic and changing overall context. It is told as a story with reference only to the phenomenon itself, rather than as a political strike that by its nature threatened the government. 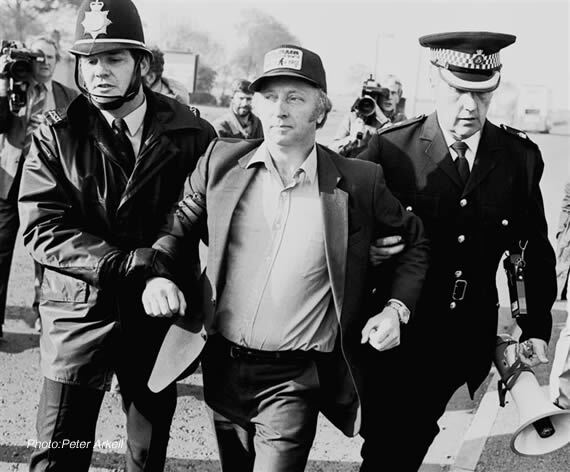 It becomes easy to criticise NUM president Scargill if the strike is seen as one which can be won or lost like other strikes depending on the tactics adopted, where the strike is seen as largely separate from the real contradictions in society as a whole that gave rise to it. Scargill did in fact insist that this was a strike against the government and the state, and after initial suspicions of the TUC (hardly surprising in view of what happened in the General Strike of 1926), he did insist that unions instruct their members not to cross the picket lines, and he did insist that the Labour Party conference in September 1984 pass a resolution of full support for the strike. And what of the question of the ballot to which the authors refer so often? The strike broke out as a result of a provocation by the NCB (at the behest of the government) in March 1984, first in Yorkshire, then Scotland, South Wales, the North-East and Kent. The NUM ratified the strike area by area as the miners took action. To have halted the action or interrupted it in order to hold a time-consuming ballot would have surrendered the initiative and the momentum of the strike to the government and its agents such as the press. A question that has been raised time and time again over the past 25 years is: why did the union not hold a national strike ballot? Those who attack our struggle by vilifying me usually say: "Scargill rejected calls for a ballot." The real reason that NUM areas such as Nottinghamshire, South Derbyshire and Leicestershire wanted a national strike ballot was that they wanted the strike called off, believing naively that their pits were safe. Three years earlier, in 1981, there had been no ballot when miners' unofficial strike action - involving Notts miners - had caused Thatcher to retreat from mass closures ... However, NUM areas had a right to ask the NEC to convene a special national delegate conference (as we had when calling the overtime ban) to determine whether delegates mandated by their areas should vote for a national individual ballot or reaffirm the decision of the NEC to permit areas such as Scotland, Yorkshire, South Wales and Kent to take strike action in accordance with Rule 41. Our special conference was held on 19 April. McGahey, Heathfield and I (the three national officials of the NUM) were aware from feedback that a slight majority of areas favoured the demand for a national strike ballot; therefore, we were expecting and had prepared for that course of action with posters, ballot papers and leaflets. A major campaign was ready to go for a "Yes" vote in a national strike ballot. The delegate conference of 19 April, to the surprise of the miners’ leaders, rejected calls for a strike ballot, instead calling for miners not to cross picket lines. This conference is hardly mentioned in the book, though an executive meeting a week earlier in which Scargill is accused of scuppering the ballot “with a procedural manoeuvre” is described in detail. The question has to be asked: what would a national ballot have achieved? By all accounts the vote would have been close, and if it had come out in favour of the strike, most of the miners in Nottinghamshire would probably have carried on working anyway. The question of the ballot was one that was used by the Tory government, the Tory press and the union leaders to attack and discredit the strike, but there was little real substance in the argument. Yet the authors of the book, again putting forward the view-point of the trade union bureaucracy, consider the absence of a ballot was, “the crucial factor in the battle for public opinion and for support from other unions”. The other great question raised in the book was whether or not there was ever a chance of a settlement. Did Scargill toss away the chance of a compromise solution? There were, as the authors point out, two critical moments when it seemed that the Tory government might lose, when the dockers came out over the unloading of a coal boat with non-registered labour in July 1984, and when NACODS, the union of the pit under-managers voted by 4 to 1 to join the strike in October. Had either of these disputes been linked to the miners strike and pursued with vigour by the TUC and the unions individually, the government would have been forced to settle. In the event, both disputes were quickly settled over the heads of the miners with lots of cash. Scargill in his Guardian article homes in on this “inexplicable decision” by NACODS and calls it a disaster. The NUM and NACODS had worked out a common programme to resist pit closures, he says. “I was later told by a Tory who had been a minister at the time that when Thatcher was informed of the NACODS-NUM agreement she announced to the cabinet ‘special committee’ that the government had no choice but to settle the strike on the unions' terms. When she learned that NACODS had called off their strike and accepted a ‘modified’ colliery review procedure, she withdrew the government’s decision to settle,” Scargill says. But the miners’ strike was more than about the world of compromises and dressed-up partial victories. It was about halting the Tory onslaught on jobs and communities throughout Britain, about challenging the state and its power to destroy people’s lives because the pits were not deemed “profitable”. In reality the strike to save the mining industry and jobs was, whether the authors like it or not, a challenge to government, a political strike that could not have been won by the miners alone. It was the moment when the plans of the government collided with the expectations of the masses, of all the people. It posed the question of power – of who rules Britain. To draw the lessons of this extraordinary strike is vital. It was not a one-off dispute to be filed away, forgotten or marvelled at. Mass unemployment is back, as the global economy crashes. What faces us all today is far worse than the recession of the 1980s. The right to a job, as a principle, again takes on a political character and again becomes a challenge to the rule of capitalism itself. In this context, the miners’ strike remains unfinished business. 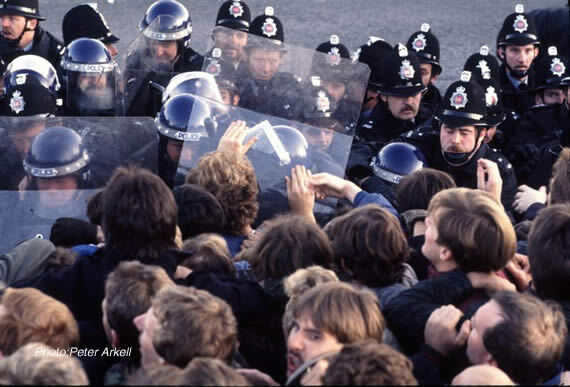 Marching to the Fault Line: the 1984 Miners` Strike and the Death of Industrial Britain by Francis Beckett and David Hencke. Constable and Robinson. Hardback £18.99, paperback in preparation. A welcome article on the miners' strike and the book by Beckett and Hencke. I don't think I shall bother to buy that book, having made a much better choice I think in buying Seumus Milne's "The Enemy Within: The Secret War Against the Miners" (Verso, 3rd edition,2004). I have one criticism - your comment that the book's attack on Scargill is in line with the Communist Party's "accepted wisdom". Sadly, I think that some key members of that party did betray Scargill and the NUM, but the main reason for the miner's defeat was the failure of the Labour movement as a whole and the Labour Party's leaders in particular to support the strike. But to say that the Communist Party - at least the one represented by The Morning Star - still takes such a reactionary view does not fit the facts as I see them. Andrew Murray, who was reporter and editor on that paper during the strike, published a review of Beckett and Henke's book (Morning Star Online March 13th 09) which was at least as scathing of it as yours and defended Scargill to the hilt. It was vitreolic enough to prompt those authors to respond in the same paper. I think it was right to publish their defence, but I would still go quite definitely with Murray's conclusions and Milne's, which seem to me to be closely similar to your own. It depresses me that almost every time I feel the need to respond to something on a socialist website, I have to bemoan the lack of solidarity in what I call the proper Left, at a time when it has never been more needed. Fighting old factional battles will get us nowhere, but it is worse to wrongfully accuse other socialist organisations about their present policies. I only read The Morning Star occasionally, but the idea that it supports a party which "has never had any intention of fighting the capitalist state" seems to me ridiculous. I don't know what age you are Charles but the history of the Communist Party is of course a very complex one. To say that the origins of the CPGB in 1920 were the same as in 1984 or 2009 is false. But to challenge the historically inadequate reformist outlook of both the Labour Party and TUC leadership, the CP needed to strike out on its OWN path with it's OWN perspective, to be revolutionary not reformist. All the key struggles from the 1926 General Strike (with Stalin's Moscow controlled 'Anglo-Soviet Committee') through to today's perspectives, show that Britain's CP is just a left-face of reformism. The Morning Star, Marxism Today and CP all opposed supporting a call for a General Strike in 1984, preferring to retain their 'links' inside the official (gradualist) movement. This is not sectarian, this is truth. Meanwhile Andrew Murray, was writing a 'History of the CPGB up to 1941' whilst editing the 'Star'. Why did he stop there? Perhaps he could resume his history writing and bring it up to date. Depressed as you may be, these lessons are 'our history'. Political prostration in the face of today's ever-deepening economic crisis has it's seeds in this historical context. I say this fraternally. Please read the history and I'm sure you will understand the essence of struggle if you want to be an informed leader of the 'left'.